Orlando, FLA. – Orlando-based Comprehensive Energy Services, Inc. received two prestigious ABC Eagle Awards for its outstanding design-build HVAC, Plumbing and Special Effects work on Transformers: The Ride 3D at Universal Studios Florida. This was named 2014 Project of the Year by Associated Builders & Contractors, Inc. — Central Florida Chapter. Representing the highest level of achievement, the coveted awards were presented at ABC’s 28th Annual Excellence in Construction Awards Banquet held Nov. 8 at the Royal Pacific-Universal Orlando Resort. Under its contract with general contractor Hensel Phelps, CES performed the heating, ventilation, air conditioning, plumbing, building automation and special effects systems work for the 80,000-square-foot fast-track project, working two 62-hour weekly shifts to meet the schedule. 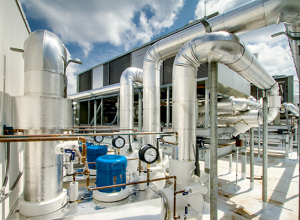 The HVAC, plumbing and special effects piping were pre-fabricated offsite, and sheetmetal ductwork was pre-fabricated in CES’s fabrication shop in Longwood and delivered daily. As Florida’s largest systems integration provider for global leader Tridium, CES also engineered, pre-assembled, and pre-programmed the state-of-the-art Tridium Building Automation System in Longwood before installation. By heavily engaging CES field personnel in the Design-Coordinate-Build process and Building Information Modeling (BIM), CES successfully performed within the existing footprint of the previous attraction. CES received Eagle Awards for HVAC, Entertainment ($1 Million to $5 Million Category) and Plumbing, Entertainment ($1 Million to $5 Million Category). Comprehensive Energy Services, Inc., Founded in 1992 by Todd and Shelly Morgan, ranks as the 4th largest Florida-based mechanical and plumbing contractor, according to ENR’s 2014 Top 600 Specialty Contractors. Led by Todd Morgan, President, a 2014 CEO of the Year honoree by Orlando Business Journal, CES is a recognized leader recently named among Orlando Business Journal’s 2014 Golden 100 Top Privately-Held Companies. For more information, visit www.cesmechanical.com.